“You’re not too old and it’s not too late. This week I rode my born-in-the-wild mare Kyra for the first time tack less: no bridle, no saddle and not even a neck rope! It was very exciting and so much fun. I felt completely confident and safe riding without a bridle and saddle because Kyra is a clicker trained horse. I know her very well and our relationship is build on trust which feels really safe. While I was doing it, I realized that this was one of my childhood dreams! I made a list of all the things I ever wanted to do as equestrian. Lots of things I have fulfilled now and that feels really good! I encourage you to do the same! In my childhood and teenage years I did many cool and dangerous, risky things with horses. ‘Nothing would happen to me’ and it turned out to be true! Tack free riding was one of my childhood dreams! The older I get, the more I know. Therefor I also know more of what can go wrong. That makes me plan more, prepare better and take less risks. This takes out a bit of the care-free spontaneous actions in riding. This week I decided to have a bit of both: spontaneous and prepared action. The spontaneous, carefree action was to do ride tack free despite my fear. The feeling of “not having something in my hands” makes me feel uncomfortable and out of my comfort zone. That is the only thing, not the tack free riding, it is really the “empty hands”. The preparation part lies in the fact I used clicker training for many years for everything: from starting Kyra under saddle to riding her. We have a really good relationship. I know I have the best and most trustworthy ’emergency break’ you can imagine in a horse. I have a click. I never used it to stop her, but I know she will stop as soon as she hears it. So that feels very safe. Two tack free rides in one week! First time I did have something in my hands: a target stick to help communicate where I wanted to go and a clicker, so that felt comfortable. The second ride this week I didn’t bring any of those two training aids. I decided to rely on my seat, tongue click and previous preparation to ride her around the arena. It went so well, above all expectations! That is also when I realized it is the “empty hand-feeling” that feels uncomfortable to me. I made a video (Watch the video) because I always want to anchor my achievements deeply in my body and brain. I am a big fan of teaching my students to celebrate their successes. How do you celebrate your successes in order to remind yourself about your achievements? If you think this is a blog that can inspire a friend to fulfill their equestrian dream, please share it on your social media. You can use the share buttons below. I also love to hear your dream and if you achieved it or still want to achieve it! I read all comments and all dreams! Don’t want to comment? Simply hit the like button so I know you read my blog. I would appreciate it. Thank you! Do you know that story about that philosopher teacher that uses a jar and fills it up with golf balls, small pebbles and sand as an analogy for creating the life you want? You can read it here. The moral of the story is to plan your life and start with the most important things first: your health, family, children, friends and passions (horse!). Those are the golf balls. The pebbles represent other things in life such as your house or your job and the sand represents the small stuff. If you fill the jar and you want the best of life start putting in the golf balls first and the sand last. If you put the sand in first there is no room left for the pebbles or the golf balls. The same analogy can be used for training your horse. Most riders are focused on the sand and they don’t see the bigger picture of what they want to achieve in the relationship with their horse. If you start planning, start with the important things like the kind of relationship with your horse you want (if that is important to you) and your bigger goals. Then you can think of the smaller goals and the fun stuff you want to do. Do you set goals or plan the future with your horse? PS You can sign up for free until December 31st 2016 for the course Set your Equestrian Goals & Achieve them (with personal support on our private Facebook group). Canter to my website clickertraining.ca and fill in the pop-up. What do you often wish when you’re at the barn? I wish I have a friend at the barn, someone I can ride with and share my successes and ruts with. I am so lucky to have someone like that at my barn. Over the years I noticed that a lot of positive reinforcement trainers (clicker trainers) are often feeling a bit alienated. They can’t really talk about their (baby step) step successes or share their difficulties at the barn. 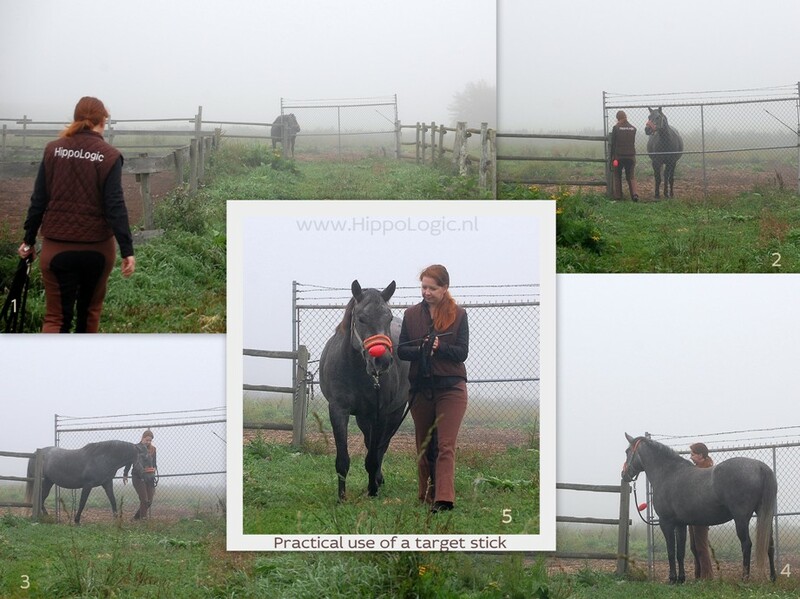 We use weird tools like fanny packs, clickers, target sticks, mats, round pens where the trainer is in the pen and the horse runs free on the outside and so on. Let’s be honest: the majority of horse owners are not yet ready to try force-free, reward-based training and riding. We, clicker trainers, often feel a bit uncomfortable around the more traditional or natural horsemanship people as well. Why? First of all: we are not born with a R+ key and even if we were, we have learned not to use it. We all have been where most people still are: forcing the horse in order to achieve your goal. Sometimes the goal is just as simple as “He has to listen” whatever that may be. Second of all: people really want to hear your quick fixes, but lose interest real quick if they learn that clicker training involves changing your own attitude towards horses and training. Most clicker trainers give up on convincing others: it just doesn’t work if people are not willing to look at what they have to change in order to get a better relationship with their horse. Most horse owners are not really interested in how they can make life easier for the horse, they want to know how they can get to their goal. Quickly. Too bad, because in my opinion it is much nicer to have the same goals as your horse. It feels much more harmonic if I know my horse is working willingly for or with me because there is something in it for her too. Anyway, as clicker trainer it is often hard to find a like-minded accountability partner nearby, or just someone to reflect your training with. Someone to share your training problems and solutions with, someone who understands what it feels like when your horse just put one foot into the trailer that day, someone who can understand that this was a huge step and knows that you and your horse will get there. One day. Together. With all this in mind I started a ‘Happy Herd’ in Burnaby, BC, Canada. A platform for positive reinforcement animal trainers with monthly meetings with a different theme each time. I hope to create an environment where horse lovers can share their stories, their successes and their difficulties. A place where we can learn from each other, encourage each other (we all have frustrations, novice as well as experienced trainers) and where people can find an accountability partner to stimulate them to reach their equestrian goals with their horse. Where they can find like-minded people and maybe even make friends in real life. A place where you don’t have to defend or explain your training method over and over. No need to be a professional trainer or seasoned clicker trainer, if you are willing to learn and share, you are welcome! My goal is not to grow big, my goal is to grow strong and to have fun and feel supported. The Happy Herd is a good place to be if you are interested or using reward-based methods to train your animal. Stepping out of your comfort zone is always easier if there is someone to hold your hand? I started my Happy Herd (where people and horses can be equally happy) group on Facebook. I am organizing our first meeting this month! I am so super excited! I already had people in the UK and Australia asking me if they can start a Happy Herd in their country. Of course, I would be honoured! Yes, that would be awesome if there started a global movement of Happy Herds. That would make me HAPPY! This is a wonderful New Years resolution for 2016. Take a look at our Happy Herd. I like to think about the future and I like making plans for me and my horse! I like to think about what I would like to achieve with Kyra. What would it feel like if we accomplish it? Here are 5 good reasons to make a planning to help you make your equestrian dreams come true. Questions you can ask yourself are: What do I want to achieve? Is it realistic for me at this time? Is it realistic for the horse I have now? Are my old equestrian dreams still valid? What would be on your list of (ultimate) equestrian goals? Write it down! Take a goal from your list and divide it into as many training steps as you can think of. These are your building blocks. Even when you have the feeling you are ‘not training’ one of the goals on your list, you are probably working on a valuable preparation for one of your goals. Your subconscious will take care of that once you have written them down. Dividing your big goal into a one year plan with 12 smaller monthly goals or even smaller weekly goals will motivate you. These tiny building blocks are easy to accomplish, so you can be proud of your horse and yourself. Set it up for success: make your goals reachable. Keeping a training journal will make it easy to look back on your accomplishments. It will remind you of all the challenges you have already faced. Looking back on those goals now, often gives you the feeling they were easy to reach, but you know they were challenges at the time. Just like the challenge you are facing right now. If the challenges seems too big, make the training steps smaller. If you can see the big picture, working on smaller goals is and stays interesting. These will keep you going, because once you have made a plan it’s easy to see how all the behaviours you train are interrelated with different goals on your list. 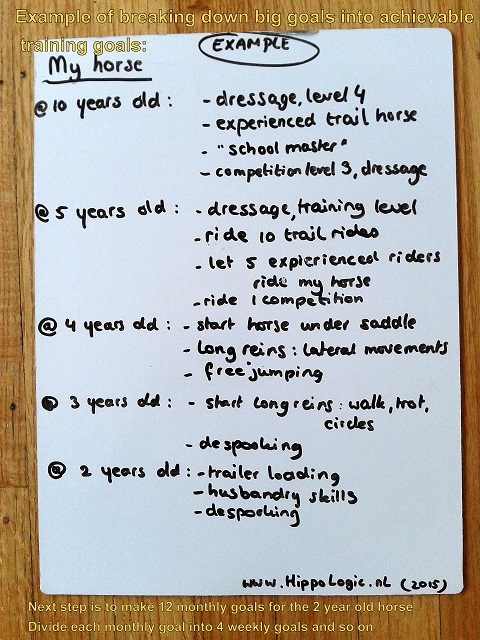 For example: you have a yearling and one of your big goals is to participate in competitions. Prerequisites for this goal can be ‘trailer loading’ or despooking exercises. If you can see how training your yearling to go willingly into a trailer now, will support your goal to take him to a competition ground in the future, it can be very motivating to start training trailer loading today. The same goes for despooking. If you can start your yearling to get used to all kinds of objects, music, strange terrain and so on, it will be a great asset when you are ready to compete. I’ve seen a lot of tips and tricks about buying a horse, but strange enough none of them spoke about how your future horse will fit into your equestrian dreams and goals. What is the most important thing you wish you could do with your (future) horse? Have you thought about this at all? When people buy horses they are often led by their emotions instead of their wit. That’s ok. If you have examined your dreams and thought about the most important features for your future horse, it is more likely that you will end up with a horse that is a good match. As riding instructor I’ve seen riders buying horses that weren’t a good fit for their dreams because they didn’t give their dream enough thought before they bought. They were excited to buy a horse and were just focused on buying “a horse”, not “a perfect match”. I would like to help you prevent this pitfall, because you can end up creating unnecessary (extra removed) obstacles to achieve your dream and become happy. So you don’t have regrets if you discover you had unconscious dreams that give you that unaccomplished feeling. Most equestrian dreams have seeds in your youth. When you grow up they stay somewhere in the back of your mind and you don’t realize that they are still there. “Are your old dreams still valid?” is another post about this subject. Maybe you discover that you’ve always have wanted to ride on the beach, but now you would enjoy endurance riding much more. Or you’ve always wanted a tall, high energetic horse, but now that your older you would be much more happy, safe and comfortable with a reliable, quiet breed. Ask yourself: What was my dream? And: What are my dreams and goals now? Does the breed serve your purpose? If you really want to make your equestrian dreams become a reality, take into consideration which breed would be more likely to serve your purpose. If you are a bit anxious and your dream is trail riding, I would suggest that you look for a breed that has comfortable gaits and an easygoing character. Think about choosing a gaited horse, for example the Paso Fino or an Icelandic horse. Read as much as you can about the breed, their history, their purpose in history, advantages and disadvantages. Visit breeders and try out a few horses to compare differences within one breed. Icelandic horses are small so that can be a nice feature, but some can be very ‘hot’. Does the size of the horse fit you? Does the breed fit your budget? Is owning a purebred very important to you or can you be just as happy with a crossbreed (remove with the same features)? If your dream is to breed or to win halter classes, owning a pure bred is more important than when your future horse is going to be a companion horse. All important questions to consider. Talk about your expectations and you dreams with a friend, so your vision becomes very clear in your mind (read about finding an accountability partner here). Prioritize your list. Is owing a beautiful horse more important than comfortable gaits? Are you prepared to compromise on gender? On colour? Conformation? Size? Breed? Purpose? Health? What would you do if you came across a horse with itch? Are you prepared to give the horse lots of extra care and blankets? What about laminitis? Do you think you can/would like to handle that? I think you can handle it, but what about all the worries that brings? Are you willing to deal with that? You will be worried if your fur baby is sick, don’t take this lightly. Don’t forget to write it all down. The best thing about writing your ideas down is that your subconscious will work on them. Of course it will happen: you are going to look for ‘that special horse’ and it isn’t a match, but that poor little thing standing in the back of the barn… She is so adorable. Let’s have a look…. This is where your list comes in handy. Even when you didn’t bring it, you will immediately know on what points you will have to compromise if you buy the ‘opposite’ of what you had in mind. The white mare instead of that buck skin gelding that is on your list. That is totally fine. Why? Because you make that decision deliberately. You might also see that she has a a lot of other features that are high on your priority list, like comfortable gaits or a gentle character. You will know that you will be very happy with this horse, even though it isn’t the perfect match on paper it will be in your heart.